"For Single Outswinging Interior or Perimeter Doors - 1500 lbs. 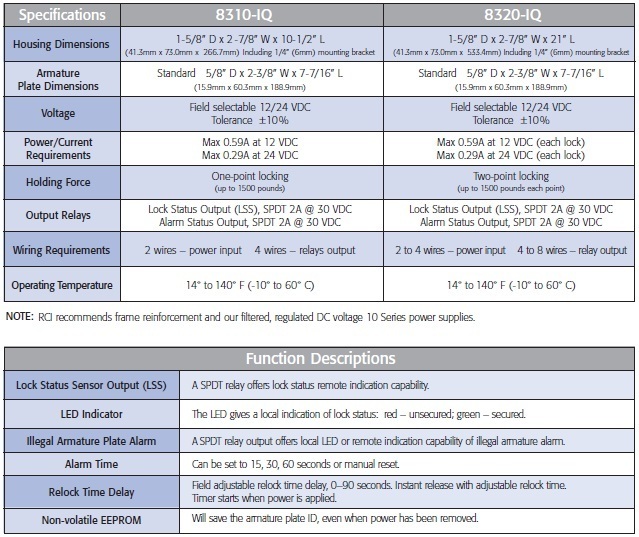 Holding Force"
- Delivery: The RCI 8310-IQ IntelliMag is factory-ordered, please allow 3-5 working days' lead time. This intelligent magnet recognizes its own armature plate, preventing anyone from "tricking" the magnet with a separate plate! Each individually encoded armature plate is registered to match its own electromagnetic lock. Applications: Interior or Perimeter. Single outswinging doors. Single inswinging doors (use with TJ (Z) bracket). Used for Office Complexes, Government Facilities, Warehouses, Retail, Commercial, Industrial & Health Care. - Encapsulated 4-bolt 'Drop-Stop' mounting.